A cool, hazy day welcomed new runners Leyanne and Hannah to October 2010's L2SOTM, which celebrated its 4th birthday with another solid turnout. 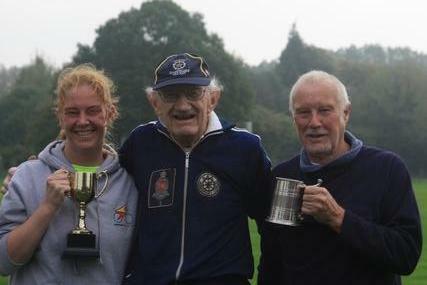 Recently-arrived Colin McNeice must have been training hard: nearly 2 minutes' improvement brought him home as Most Improved Man and Katie King stormed round to successfully defend her Most Improved Woman trophy. Many congratulations to them. A special mention goes to Andy, returning after injury. With Jeremy and Maggie away marshalling the Solent Half Marathon, special thanks go to Emma Smith, coordinating events, and Jonathan Evans, chief timekeeper for the day. Thanks, too, to Jack as Finishing Marshal and for presenting the trophies; to Graham for helping and supporting; to Maggie for leaving, in absentia, some flapjack for us; to the Goulds (and a tired Katie, after the race) for the signs and to the Cricket Club for the venue. Last, and absolutely not least, a great big Thank You! goes to Jack and Jim Dundas, whose first run was last month and who brought some absolutely scrummy cakes as post-race recarbohydratification [or whatever - Ed. ].